Wadebridge Coasters Cycling Club traces its origins to the celebrated Camel Valley Cycling (and Triathlon) Club. The original club had remained exclusively focused on competitive road cycling and a need was perceived for a club that catered for the broader cycling community of the 2010s. Despite 'splitting' off from Camel Valley, many Coasters retained strong emotional ties with their old club, particularly the Coasters' founding chairman Damian Cudmore who remained a 'second claim' member of CVCTC. And this newspaper cutting from 1981 mentions the exploits of a young Rodney Maclean, who since became one of the Coasters' most popular characters. 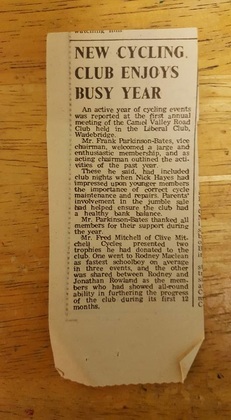 On Wednesday 20th July 1981 a meeting was held at the Wadebridge Liberal Club in hope of forming a Cycling Club in the local area. Club officers Nick Hayes (Chairman), Frank Parkinson Bates (Vice Chairman) and Bob Simpson (Treasurer) were elected and the 'Camel Valley Road Club' was formed. Club Sunday rides were organised and weekend rides to youth hostels were also held regularly. Time Trials were proving popular, the courses used were on the Bodmin to Camelford, Padstow to Winnards Perch, and Royal Cornwall showground to Winnards Perch roads. The club continued to expand and by 1984 the members numbered over 20, but this proved to be the climax of success. 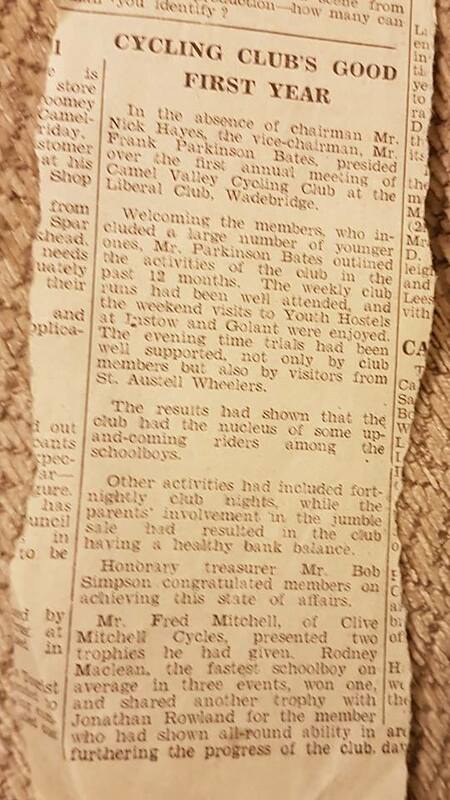 Interest in cycling began to lessen in the North Cornwall area and by 1986 the club had ceased to function so the committee and members disbanded. In 1987 Jill & Ivor Edmonds moved to the Wadebridge area where they were introduced to Frank Parkinson-Bates (Camel's original Chairman). Their enthusiasm to reform the Club soon had new members coming along. Time trialling, club nights at the Scout Hut, and organised training proved to be the most popular activities. Time Trials were competed on the A39 Royal Cornwall Showground to Winnards Perch roundabout finishing near Tolgate Garage. Another course that proved popular at this time and which is still used today is the S6 Tresillian to Brighton Cross roundabout and back. Money was raised in every way possible for kit and equipment: Coffee mornings and bring and buy sales were popular and raised the necessary funds. 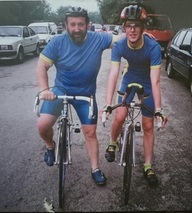 Success in racing began to appear in the early 90s when John Bullingham and Chris O’Neil were becoming Cornwall’s fastest short distance riders. Most Open Time Trials in the SW District were won by these two top local riders. Current Club Chairman, Damian Cudmore has been involved with the club for over 28 years, having started as a 12 year old. ​In 1997 the Club sought a suitable sponsor, local business man Ian Hobbs of Bude. Already a member, he offered to support the club with some of his financial projects. 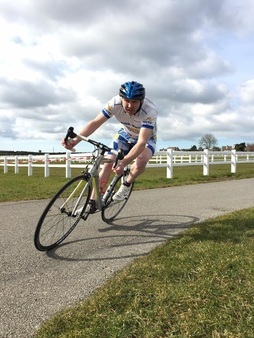 One of the new members to come along at this time was Stuart Dangerfield, already a well known national cyclist. Success followed success. 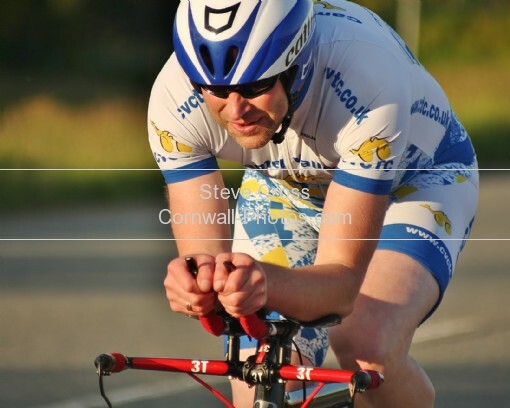 Stuart's training in the Cornwall area enabled him to find his best form, resulting in him winning the National 10TT and 25TT in successive years and also the National Circuit Championship. 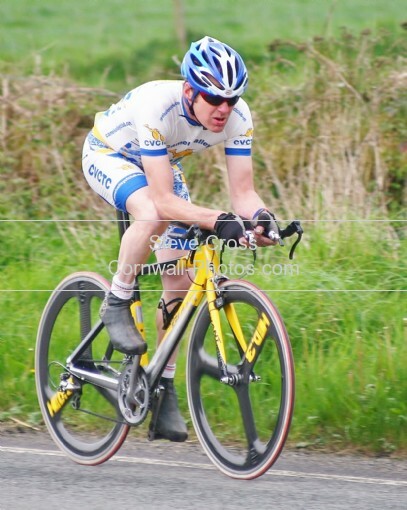 His most successful season was in 2001 when he broke the National 10TT record with a time of 18mins 19 secs. Other members were making a name for themselves too. 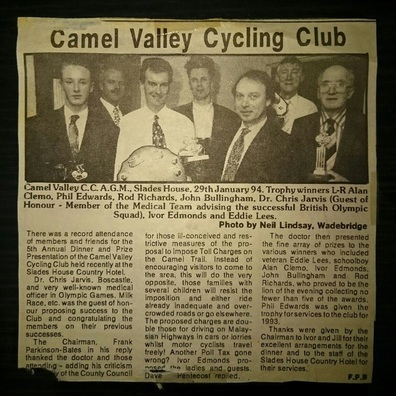 Wales was a popular venue and in 2000 the club won the Welsh National 50 Team Trophy. Other awards in the SW District are too numerous to mention. In 2001 Wendy Houvenaghel joined the club with her Husband Ian and from the very beginning her ability was obvious. Within two years she won her first National Title. Wendy has represented Great Britain on the road and the track. For some years Dales Renault, a Cornish based Car Dealer, sponsored Camel Valley and the club were extremely grateful for their support. Along with Stuart and Wendy, Chris Opie and Steve Lampier are two more riders who started with the club and have gone on to make a name for themselves on the Professional circuit. 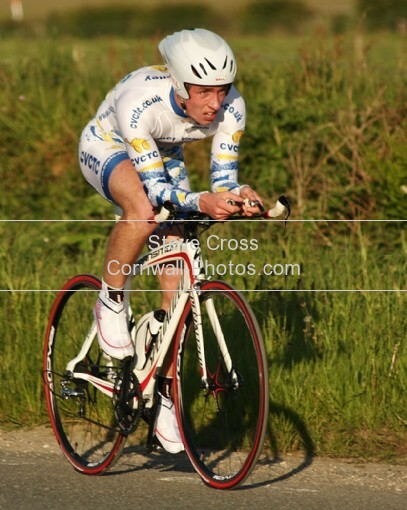 2006 saw Harvey Alford break the National age related record for a 25TT, with a time of 1hr 3min 20 sec. Not bad for 79 years of age! 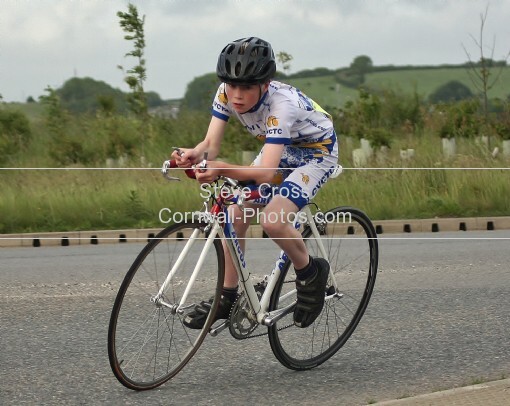 At the other end of the age scale Sam Hughes won the Junior District Road Race. Dean Fuller finished a credible 4th place in the 13 years category. There is only a short history of the Triathlon section with some great success. Guy De Selincourt gained International Selection in the Duathlon. Also Tom Daniels and Ian Hobbs gained age group selection for GB in the Worlds events. In 2012 Mike Parsons, took Gold in the Sprint Distance M20-24, at the ITU Age Group World Triathlon Championships in New Zealand.